All of the furnishings in the Studio are brand new and have been thoughtfully selected for your comfort. The studio faces a quiet side street and is sunny and bright, with four 8' windows and 10" ceiling. 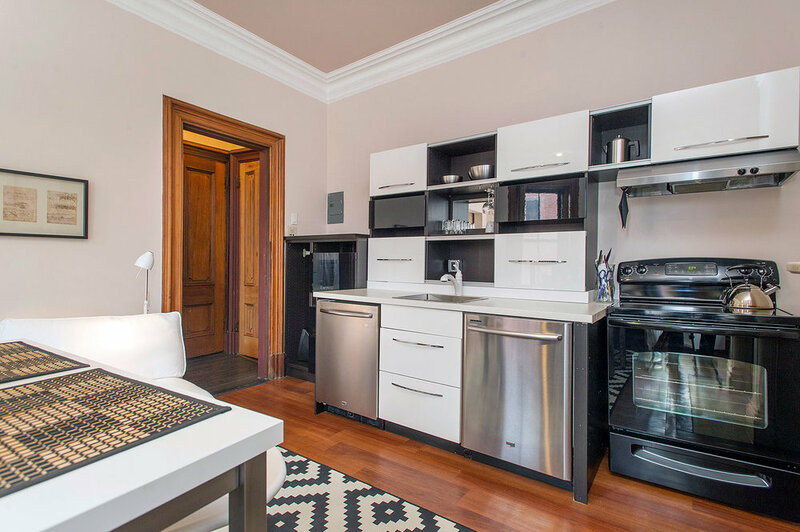 This South End apartment includes a custom kitchen with full size dishwasher, flat screen television, and wireless internet. Guests will enjoy the views, relaxing in the comfortable seat and using the Victorian bathroom. This apartment has many thoughtful features that make it a very rich environment, offering many experiences, such as the addition of a dressing area, with built in storage, and a traditional Victorian bathroom. There is a separate, adorable, panel room with an arch-top window that contains a sink and toilet.